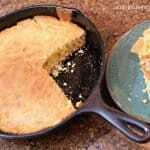 There are a couple of different ways to make cornbread, but my favorite is cast iron skillet sweet cornbread. 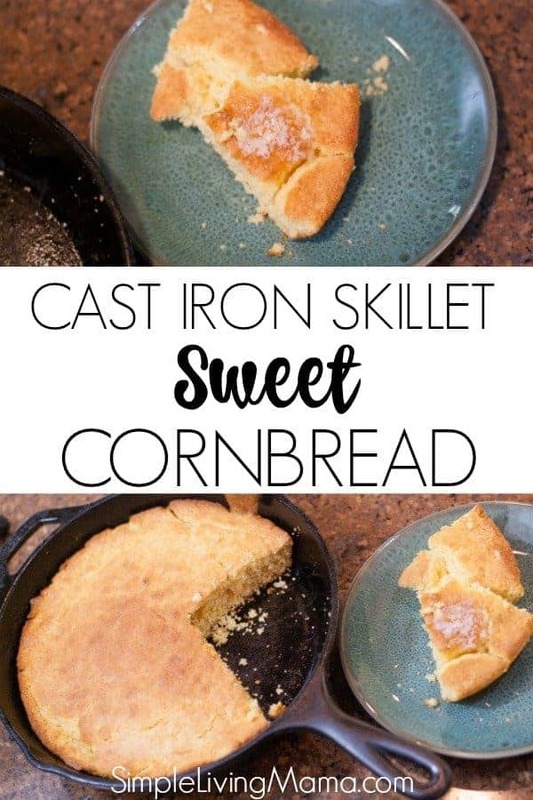 My entire family prefers sweet cornbread to savory, and I think turning it into a cast iron skillet recipe makes it just perfect! I keep most of these ingredients in my pantry, so I can easily whip up a batch of cornbread as the perfect side dish to any meal! First, you’ll need to gather the ingredients. First, mix all of the dry ingredients in a bowl. Once all of the dry ingredients are incorporated, mix in the rest of the ingredients. Do not over stir the mixture, but make sure all of the ingredients are well incorporated. Heat your cast iron skillet and melt some butter in it. Make sure you get melted butter all over the bottom of the skillet. 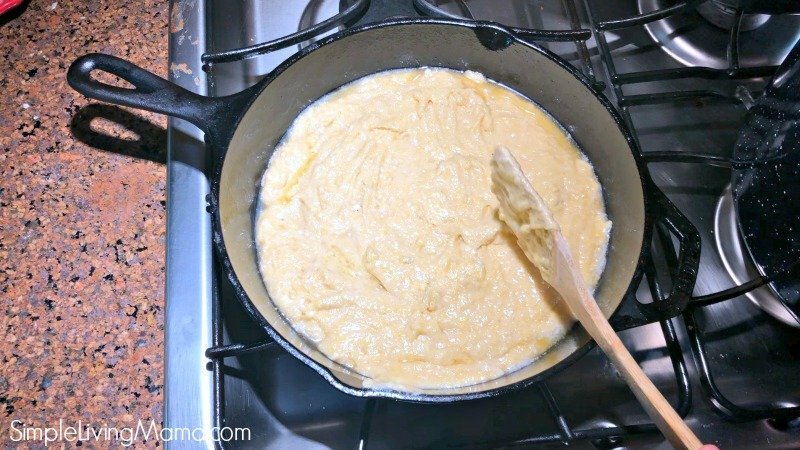 Smooth the batter into the cast iron skillet. Bake in a 400 degree oven for 20 to 25 minutes until a toothpick inserted comes out clean. This cornbread will be sweet and perfect with some butter on top. I love to take the cornbread and dip it into my chili. It’s probably my favorite topping! This recipe would also be good as a base for a chili pie or even a taco pie! 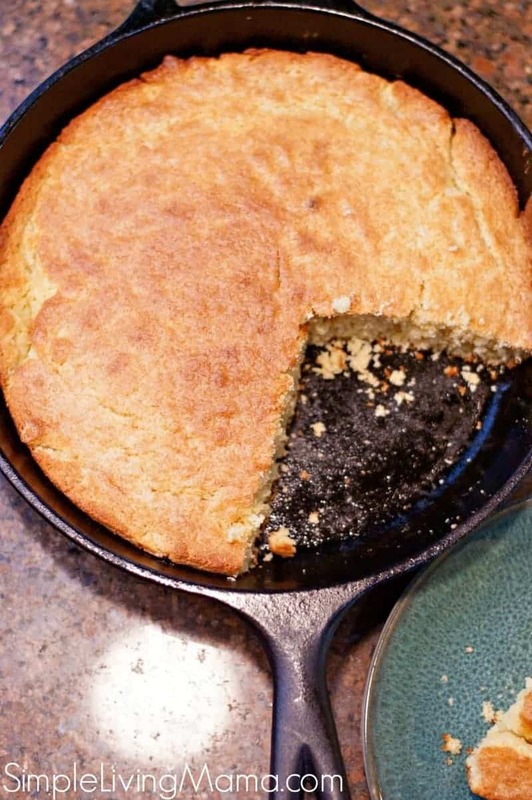 My kids beg for this cornbread on chili nights and devour the entire pan. Something about cooking it in a cast iron skillet just makes it taste better! So, so delicious! I use my 10 1/4 inch Lodge cast iron skillet for this recipe. 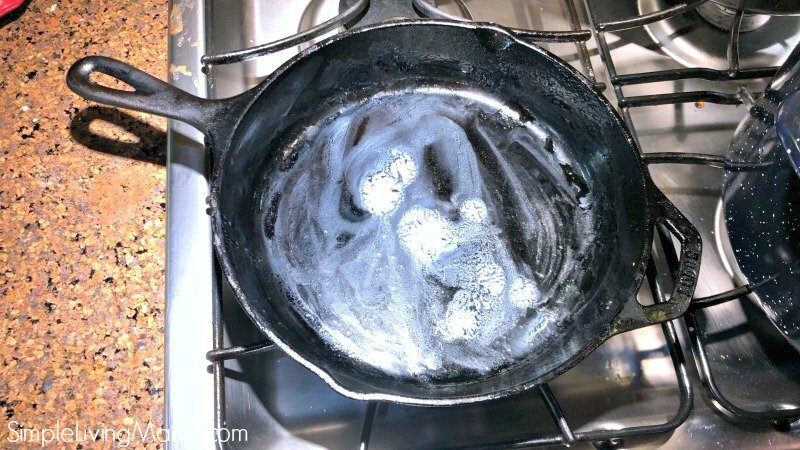 Learn how to care for cast iron with my Cast Iron 101 comprehensive post! 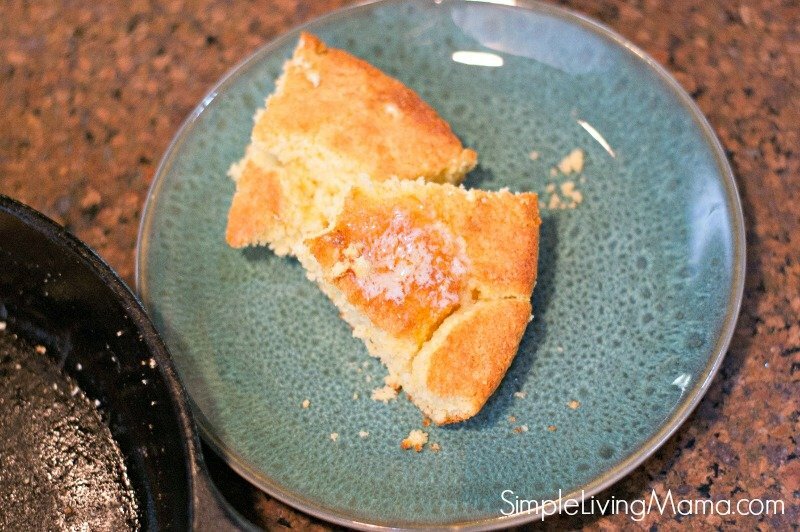 A delicious sweet cornbread baked in a cast iron skillet. Add wet ingredients and stir until well incorporated. Melt butter in a cast iron skillet. You have obviously never lived in the South. To say sweet cornbread to them is sacrilegious. It is actually called Corn Cake. To tell you the truth I am from the Midwest and I don’t like cornbread in any way shape or form except for the cornbread dressing recipe my husbands Aunt gave me when I was a new bride 48 years ago. Now her recipe for cornbread was different. She did not use flour but what she did was use Yellow corn meal and White corn meal. The white cornmeal has almost the same grit at flour but not the gluten that flour has. Mix the dry ingredients until they are all mixed well. 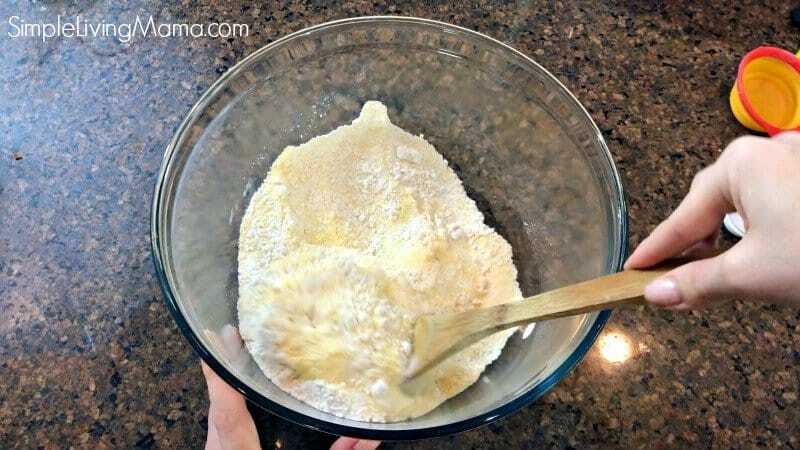 Add the melted butter in the center of the dry mix and mix into the dry mix. Add enough butter milk till you get a thin batter. I bake it in a 26″ cast iron skillet until browned on top. This is my biggest skillet that my husband gave 28 years ago and a skillet of cornbread does not last long in our family. My husband puts some of it up before anyone gets their hands on it so he can have a piece every day for breakfast and supper for the next week. Hi Jackie. Thank you for the comment, but actually I was born and raised in the South and haven’t lived anywhere else. If we want to get specific I’ve lived in LA, AR, and AL. Can’t get much more southern than that. Maybe your idea of “corn cake” is specific to a certain area in the South because when we hear corn cake we think of corn fritters and they contain actual kernels of corn. My family prefers sweet cornbread as a side dish and unsweetened cornbread for cornbread dressing and cornbread salad. We also prefer flour as none of us have a gluten intolerance. Hi and thanks for the recipe! I have recently switched from a glasstop stove to a gas one and cant wait to bring out my cast iron pans! Will definitely be trying your recipe. I am a celiac but I will use my gf flour and so how it goes. Stay blessed! I have currently switched from a glass pinnacle stove to a gasoline one and cant wait to bring out my cast iron pans! Will virtually be trying your recipe. i am a Celia but i can use my gf flour and so the manner it’s far going. live blessed! Thank you so much for your recipe!